Advanced TRS by Coseva is zeolite binder that detoxes the body of toxins such as heavy metals. It is a newer product that uses nano technology (an unprecedented size of .9 nm) meaning that the small molecule size can easily penetrate deep within the cells and cross the blood brain barrier for a neuro cleanse. The basic way it works is that the zeolite mineral clinoptilolite is negatively charged and it naturally attaches to positively charged toxins such as arsenic for example. According to the manufacturer, the zeolite and its attached toxins are excreted from the body within 6 to 8 hours. 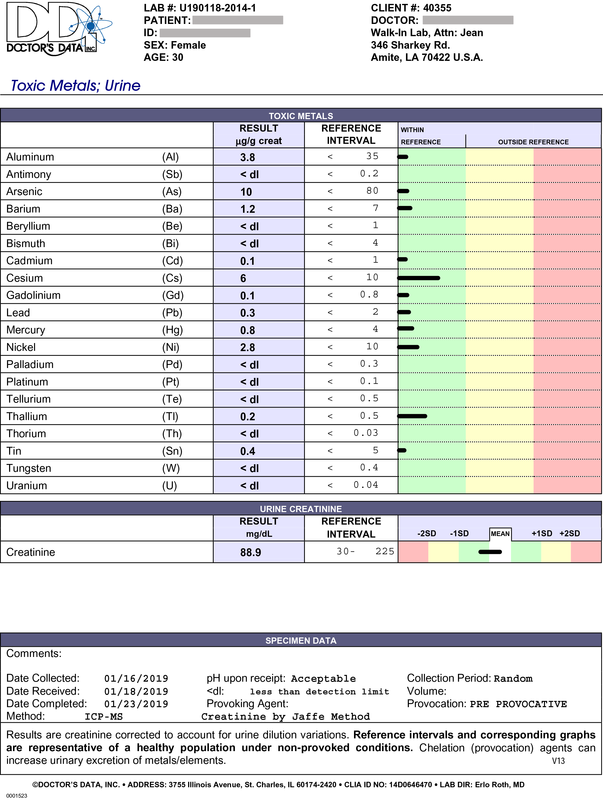 I became interested in doing metal hair, blood, and urine testing in late 2017 after a sudden adverse reaction to chromium picolinate supplements. This adverse reaction ultimately led to my Lyme diagnosis. For this current experiment, I wanted to test the utility of Advanced TRS as a provocation agent. To my knowledge, this has never been tested before. Similar to how classic chelators such as IV EDTA are used as a single one time provocation agent, I wanted to test this alternative chelator Advanced TRS. The manufacturer recommends that adults take 5 sprays a day to see long term reduction of the body’s burden of toxic metals and other positively charged toxins. 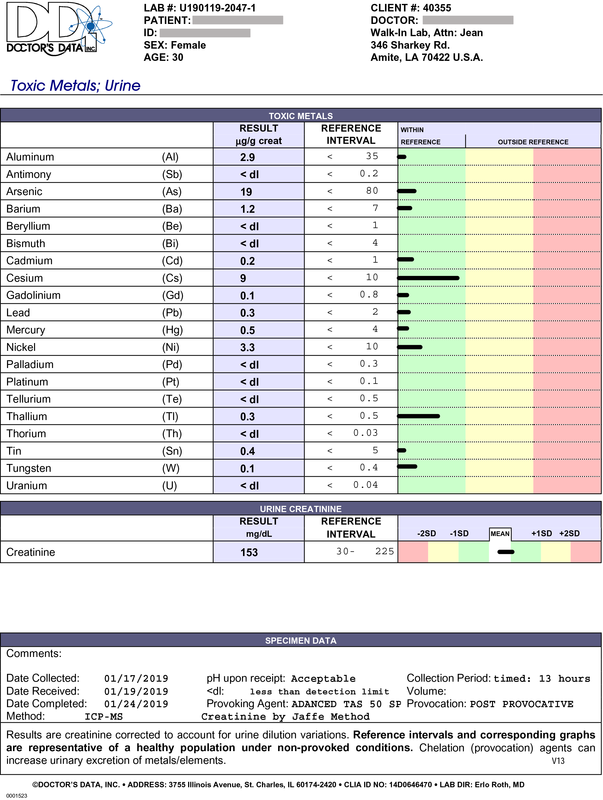 The manufacturer even conducted their own n=1 study on a healthy subject and found that in 90 days there was a 190% increase in arsenic excretion, 143% increase in mercury excretion, and 137% increase in lead excretion. Again my goal was to see how well Advanced TRS can serve as a one time provocation agent, not measure longer term heavy metal burden. One problem with measuring excretion values over a longer term of say 90 days is that small dietary changes and other environmental changes are confounding factors to consider, especially when you are measuring the results of only one person, n=1. For this reason, I figured it would be best to have a baseline and provoked sample separated by about 24 hours. To establish my baseline I took Advanced TRS for 33 per manufacturer’s instructions of 5 sprays a day and did not have any adverse events. I then stopped taking TRS for 48 hours before I took my first pre-provocation urine sample. For the actual provocation, I took 50 sprays of Advanced TRS the following night separated in two 25 spray doses. Because the manufacturer claims that the zeolite is excreted within 6 to 8 hours, I figured that a 13 hours specimen collection period would suffice. 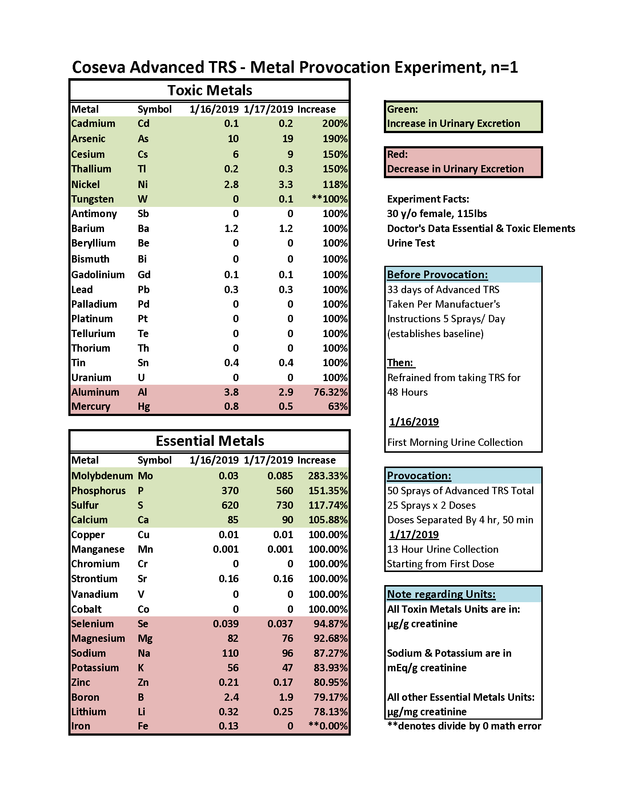 Results – For my 50 spray Advanced TRS provocation, there was a 200% increase in urinary excretion of cadmium, a 190% increase in urinary excretion of arsenic, and a 150% urinary excretion of both cesium and thallium. As an aside, about a month ago I was consuming more organic kale in the name of healthy living only to find out out that kale (even organic kale) may contribute to thallium and cesium toxicity. Additionally there was actually a decrease in urinary excretion of aluminum and mercury. The reason for this is unclear but no conclusions can be made as I only have data from one person over a short period of time. The manufacturer’s study found that the healthy subject had a 143% increase in mercury excretion in a 90 day time span. 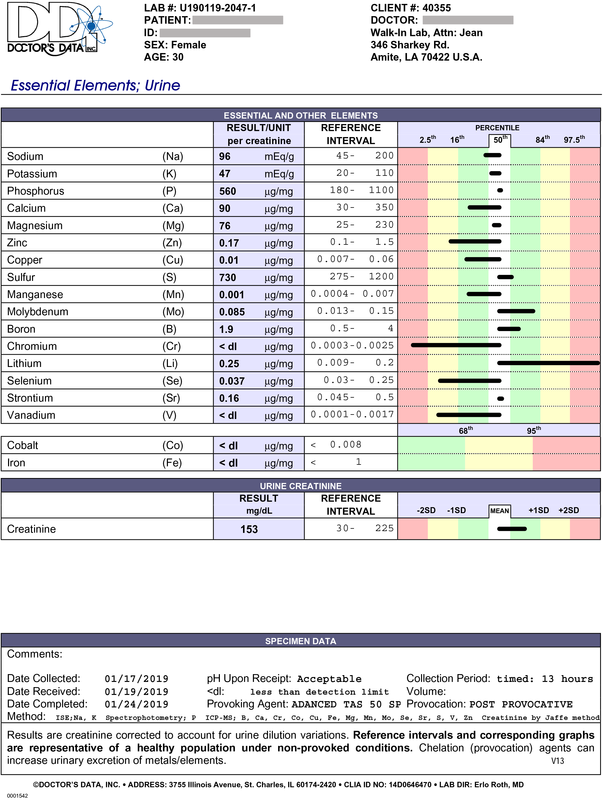 It’s important to note that my two urine samples did not have any toxic metals that are technically out of range. But for the cesium and thallium that were relatively higher, Advanced TRS did in fact increase urinary excretion. Results may be more telling if this same type of setup was conducted on someone with an acute mercury or gadolinium toxicity for example. I encourage others to do their own before and after testing as well and share their results. This way we all can learn about the power and utility of these nano zeolites. I am also interested to see if this product can increase excretion of other types of positively charged undesired molecules such as parabens. If you are interested in trying Advanced TRS while also supporting my little experiments, you may order direct from the manufacturer. If you are interested in purchasing a heavy metal test kit, you may order the Doctor’s Data kits here.